'March For Life' Kicks Off In D.C., Drawing Anti-Abortion Demonstrators From Across The Country : The Two-Way Mike Pence is the first vice president to address the decades-old annual rally that abortion-rights opponents call the March for Life. The event is drawing comparisons to last week's Women's March. The demonstration, which has been held each year since the nationwide legalization of abortion in 1973, is celebrating a seminal moment in its decades-long run: a speech from a sitting vice president. "Life is winning in America!" Mike Pence told the audience. It was a phrase he repeated often during his brief speech, emphasizing the electoral victories of anti-abortion candidates. That includes President Trump, in particular, who asked his vice president to attend the rally, according to Pence. Americans now have "a president who I proudly say stands for the right to life," Pence told the crowd. 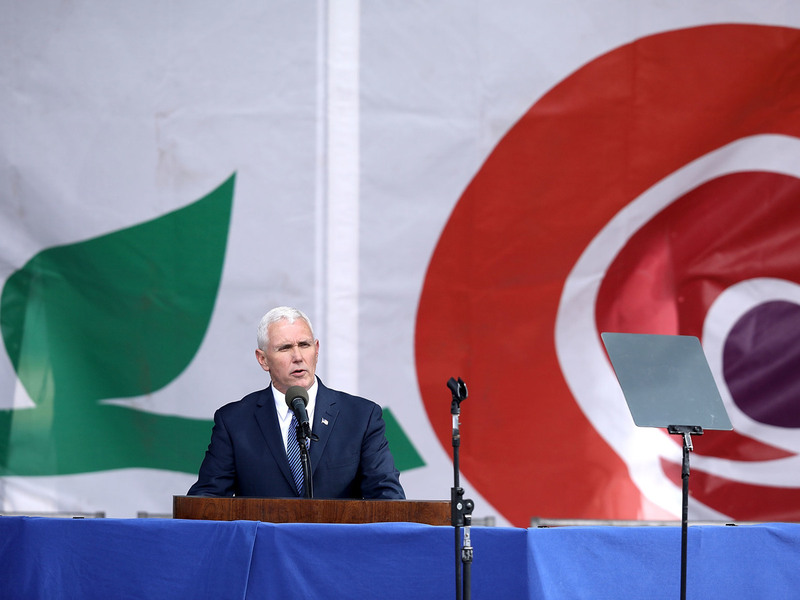 Vice President Pence addresses the rally on the National Mall on Friday. And Pence wasn't the only representative from the White House on the rally's schedule. Presidential adviser Kellyanne Conway also addressed the demonstrators. "It is no coincidence that the first right cited in the Declaration of Independence is the right to life," she said. "It is a right; it is not a privilege; it is not a choice. It is God-given." Though he was not there himself, Trump tweeted a message for protesters earlier in the day: "To all of you marching — you have my full support!" The demonstration had explicitly religious overtones. It opened with a Christian rock concert and featured a prayer led by Catholic Archbishop Timothy Dolan of New York. 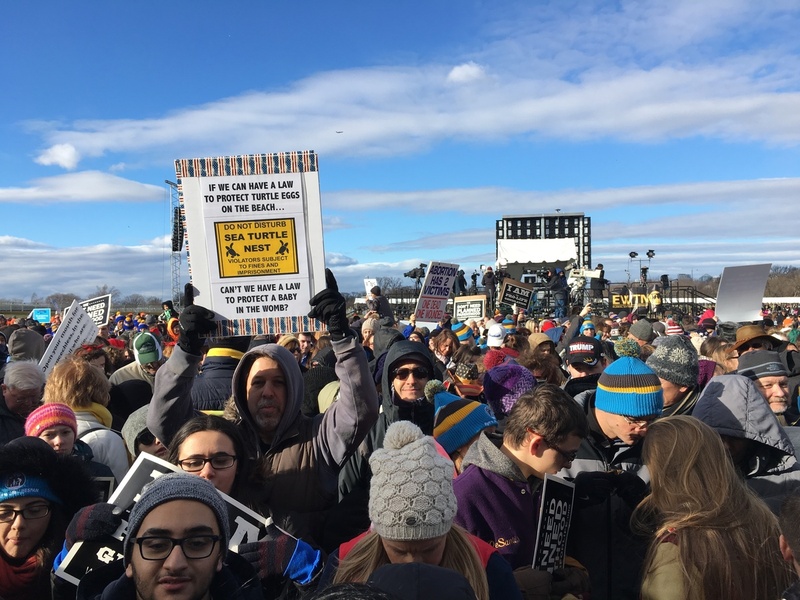 Amid the crowd, which began gathering hours early for the rally, NPR's Sarah McCammon noted that many of the protesters' signs quote biblical verses — among a spate of other signs calling for defunding Planned Parenthood. "We demand the immediate eradication of abortion," the musical group Transform DJs told the crowd as they opened the day's program. "As we follow Jesus, this atrocity will stop with us." At a rally rippled with chants of "We are the pro-life generation," Sarah noted there seemed to be a wide range of ages among the demonstrators in attendance. As Sarah has reported, the brief interlude between this rally and the march that flooded the same spaces last Saturday makes for an abrupt juxtaposition. People gathered for Friday's rally in Washington, D.C., held up signs, many featuring verses from the Bible. Among the many pillars of the platform published by organizers of the Women's March on Washington, "open access to safe, legal, affordable abortion and birth control for all people" was central. And while some groups are participating in both demonstrations, the overlap in people attending both isn't expected to be large. "I think we're a pretty different march — we're a one-issue march," March for Life President Jeanne Mancini told Sarah. 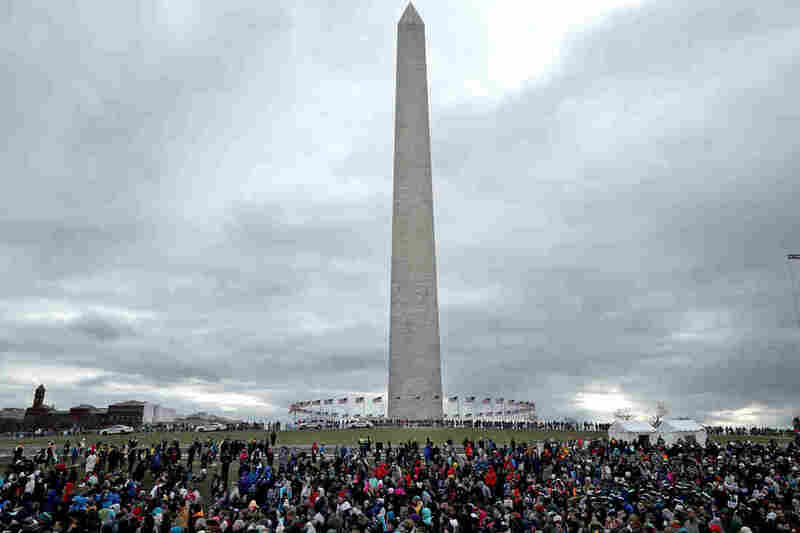 The day's schedule opened with an hourlong rally and segued into a march toward the Supreme Court and Capitol buildings, where demonstrators were asked to visit their congressperson to advocate for their cause. It kicks off a weekend of associated marches planned in several other U.S. cities, including Salt Lake City, Denver and Austin, Texas.